Have you ever wanted smooth, clear skin but feared that a chemical peel could be too harsh for you? 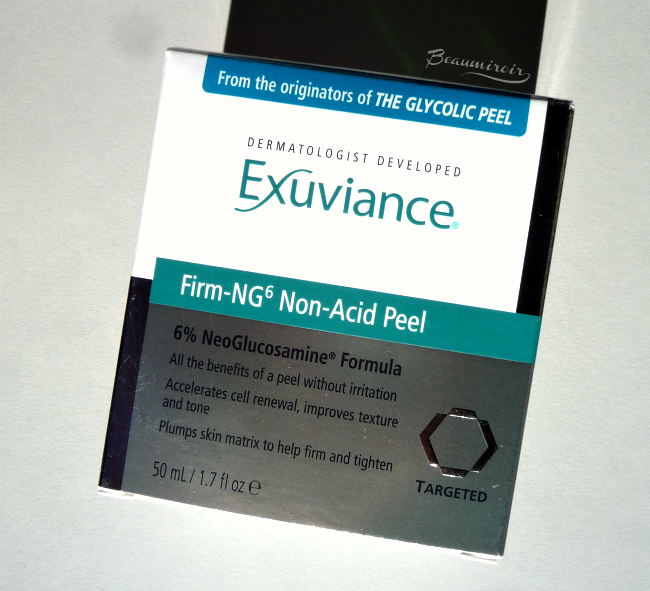 If yes, then you should definitely try Exuviance's new Firm-NG6 Non-Acid Peel. The idea behind this product is that you can exfoliate and renew skin without the irritation by using the right ingredient, NeoGlucosamine. I've been using AHA (glycolic acid) and BHA (salicylic acid) for a while now, but I noticed lately that my skin was developing dry patches. It wasn't really visible in itself, but when I used liquid foundation, it would cling to these areas and make them very obvious. I talked about it with an aesthetician and she suggested that I switch to a richer moisturizer, but also that I stop using the exfoliating acids every single day. Of course I didn't want to stop exfoliating completely (my skin gets rough and bumpy if I don't) so I turned to the Firm-NG6 Non-Acid Peel. I've talked to you about the brand NeoStrata before, and explained that its founders revolutionized modern skincare by discovering AHA. 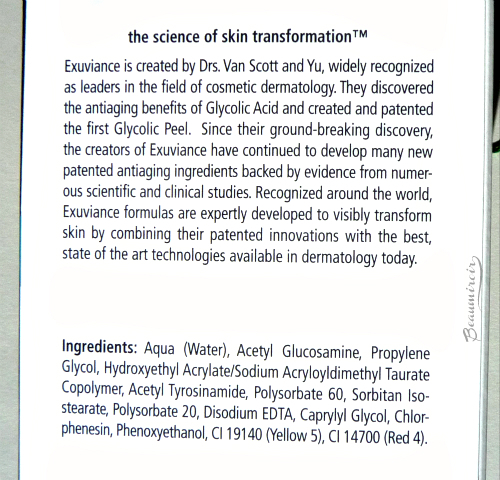 Well, Exuviance is NeoStrata's upscale daughter, and the scientific teams behind both brands are the same, so if someone knows how to do a peel, it's them. They make solid, science-based formulas that rely on ingredients proven to be safe and effective. 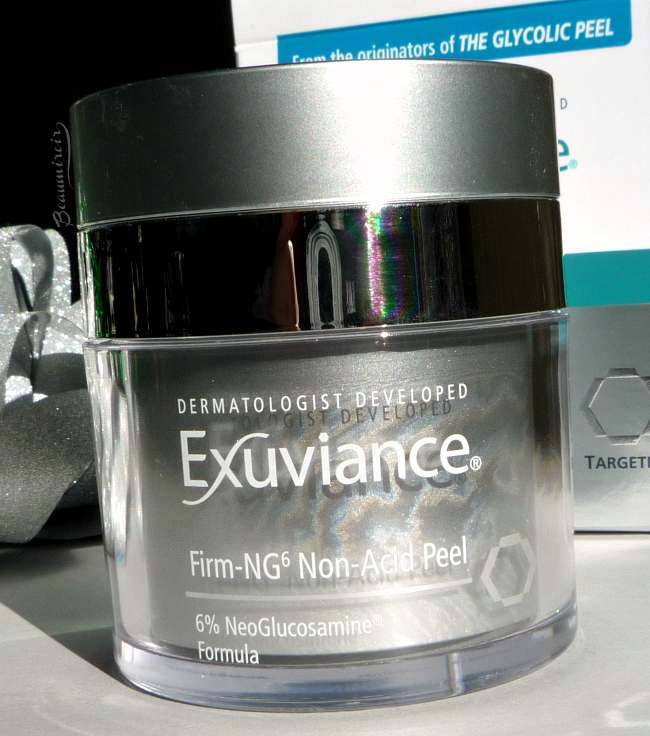 Here's what they promise about the Non-Acid Peel: "New Exuviance Firm-NG6 Non-Acid Peel is formulated with NeoGlucosamine® to increase cell turnover and exfoliation for all the benefits of a peel without the potential for irritation. 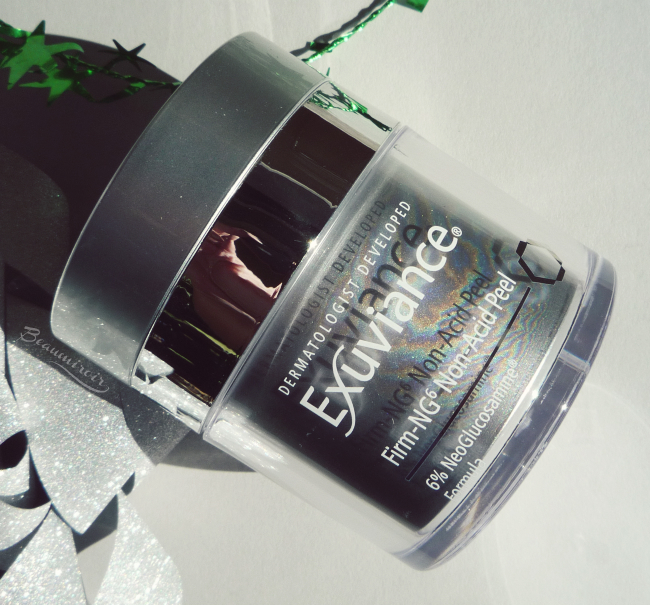 More than just your average peel, this leave-on, no-rinse formula, appropriate for all skin types, plumps skin matrix to increase volume and helps firm and tighten skin while exfoliating to reduce pigment and brighten skin." A word about NeoGlucosamine: this is a trademarked name, but as far as I can tell from the ingredients list (see full list below) it's Acetyl Glucosamide, a non-acid substance that receives the rating "Best" in Paula's Choice ingredient dictionary. It's a component of hyaluronic acid (the star hydrating ingredient) and it's considered a skin-identical and skin-repairing ingredient. A lot of the research demonstrating the exfoliating and anti-hyperpigmentation properties of acetyl glucosamide were done by cosmetics companies and not independent researchers, however some studies were published in top tier peer-reviewed dermatology journals, and Paula's Choice describes them as "compelling". 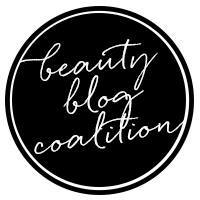 How to use: the Non-Acid peel is supposed to be smoothed over clean skin in an even layer without rubbing. After skin has absorbed it (5-10 min according to the brand, but it's faster than that for me), you should follow with a moisturizer. I've seen conflicting information about how often it should be used, daily or once to twice weekly, so I decided to take the conservative approach and used it twice a week. Now let's talk about my experience with the Firm-NG6 Non-Acid Peel and what I liked or didn't like about it! - I really like the hefty jar. It's clear plastic with an inside container in a silver color that creates rainbow-like holographic reflections. I would describe the design as "elegantly clinical". It looks like it comes out of an Upper East Side dermatologist office rather than from a department store. - Jar packaging is usually problematic because it's unsanitary, but in this case the jar is equipped with an ingenious system to dispense the product. You push what looks like a flat top on the jar to activate a pump, and the product comes out of a well in the middle (see the photo below). You never see or touch the inside of the jar, so the content is protected from bacteria and degradation by air or light. You can wipe off that top if necessary, and I never had product drying out and blocking the pump (common problem I have with cosmetics that come in classic pump bottles). - It feels fresh on and spreads well in a even layer, without ever pilling or balling up, even when I apply my moisturizer on top. - I've never experienced any burning, tingling sensation, redness or any other sign of irritation, and my dry patches are gone. It feels really gentle and I think it can be used by anyone, even with sensitive skin. - I use it at night and my skin feels smooth and looks radiant the next morning, with tighter pores. I've also noticed a slight improvement in the scars left by recent acne breakouts on my chin: they're a little less red. 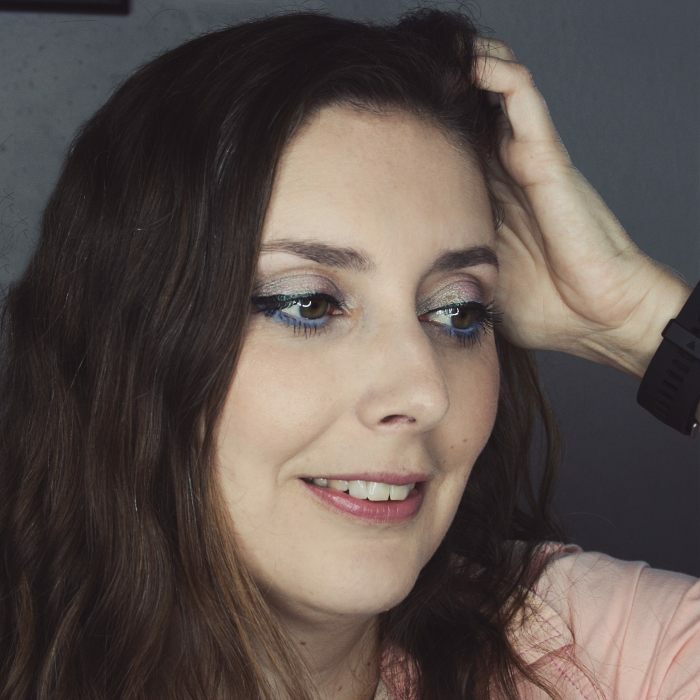 Of course it must be used consistently over time to show its full benefits, like any other anti-aging skincare product, and you can't expect a miracle in terms of firming, but the short-term results are good! The jar has a pump! - It feels a bit sticky on. I don't really feel that tackiness anymore after applying my moisturizer on top though, but I wouldn't use it in the morning for that reason. - While I wait for the gel to be absorbed, my skin feels a bit tight, so I definitely need to use a moisturizer afterwards. That's not a problem for me, but if you're looking for a one-step treatment that does it all for your nighttime routine, you should be aware of that. I think you can tell that I like it! If you've been following me, you know that I can be a harsh critic when I believe that a company makes excessive claims or uses pseudo-science to market a product. 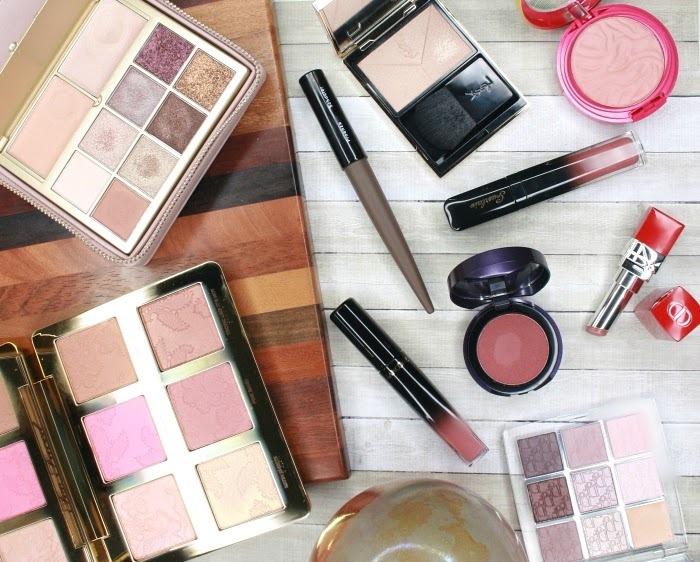 On the other hand, I get pretty excited when a brand keeps it real and makes innovative formulas that really deliver, and for me that's the case here! If you're new to peels, if you have sensitive skin, if you've ever had irritation from a classic acid peel, or if like me you just want to be a little gentler with your skin for a while, the Firm-NG6 Non-Acid Peel is a great option to try. At $68 it doesn't come cheap, but it doesn't reach the insane price level of some department store brands - that are often based on magical thinking rather than science! Where to buy? Exuviance website, or the following retailers below. The product featured in this review was provided by the brand PR through Brandbacker for consideration. I received no compensation other than a free sample to write this post, which only reflects my personal opinion. This post contains affiliate links.